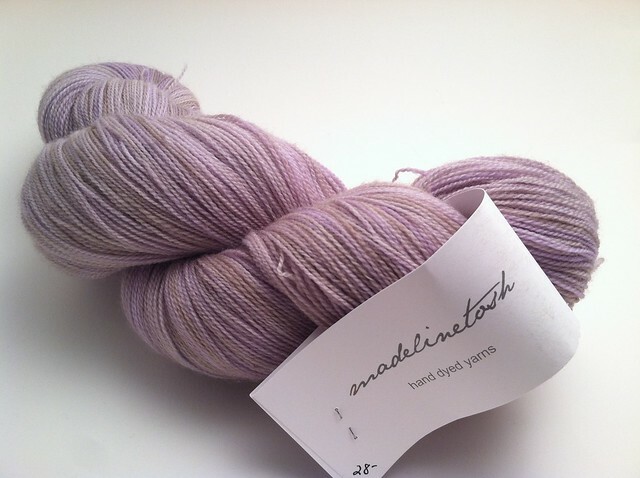 I have this skein of Madelinetosh lace that is sitting in my stash bin, waiting to be turned into a dress. I initially intended to design a dress pattern for the yarn. In fact, I have a few not-entirely-complete designs floating around somewhere in my brain, but along with Liesl, these two patterns make me wonder if I'm just wasting my time when other gorgeous things already exist. 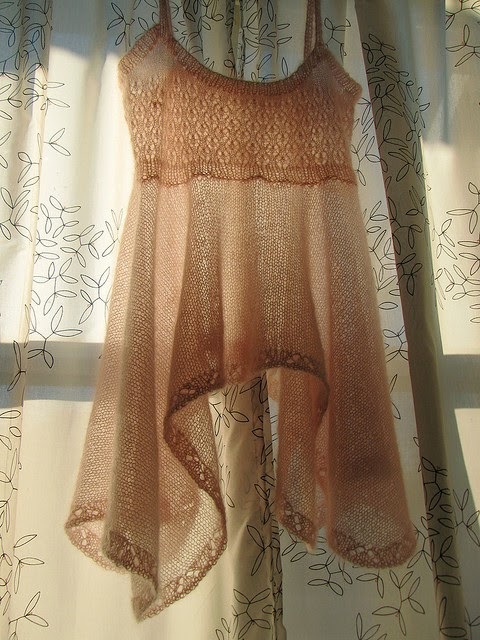 The first one, Teva Durham's Shetland Shawl Dress, is the kind of fluttery little overdress that makes my hands grabby in a store. These types of dresses, when found in the retail wild, always seem to cost some ridiculous amount- $200 or something. 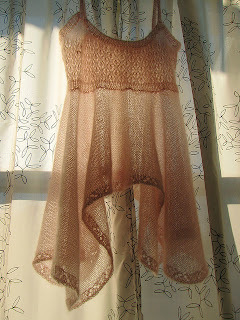 I'd need to find the right sheath to wear under it, obviously, but very pretty. Along with these two and Liesl mentioned above, there's also Jennie Atkinson's Butterfly Dress, another lacy dress with a flapper twist. The middle two dresses- the shawl and lingerie ones- are both in publications and not available as a Ravelry download. Maybe it's unfair of me, but I'm just plain uninterested in a pattern once it becomes obvious that I have to go off and buy a $25.00 book or hunt down a years-old magazine. I wonder if the publishers of the books are keeping the patterns from being distributed on Ravelry or what, but it seems like a wasted opportunity on their part. You've got more than enough skill and talent to use any of those pictures as a springboard for a design of your own. I like the butterfly dress as is, I think, but it's hard to see the details of the pale dress over the cream slip. While I like the idea of the shawl dress, I think it creates some unflattering diagonal lines as executed, and is dropped too low over the hip on the split side. I also don't care for some of the lace patterns she uses. The lingerie one is cute as top with the greatly uneven hem, but at dress length I think a less extreme difference would be nicer. Of course, these are just the opinions of an old man who wouldn't wear any of them, and who doesn't always "get" women's fashion anyway. I recently found out that some book publishers are telling pattern designers that if they also sell on Ravelry, the publisher will pay them less. So it's putting designers in a complicated position. I have to agree with your comment about having to hunt for a print pattern. I would love to know the reasoning behind not putting them up for purchase on Rav after a certain time period. I tend to create my own rather than hunt for a print pattern.